See The VIRTUAL TOUR Link Below. 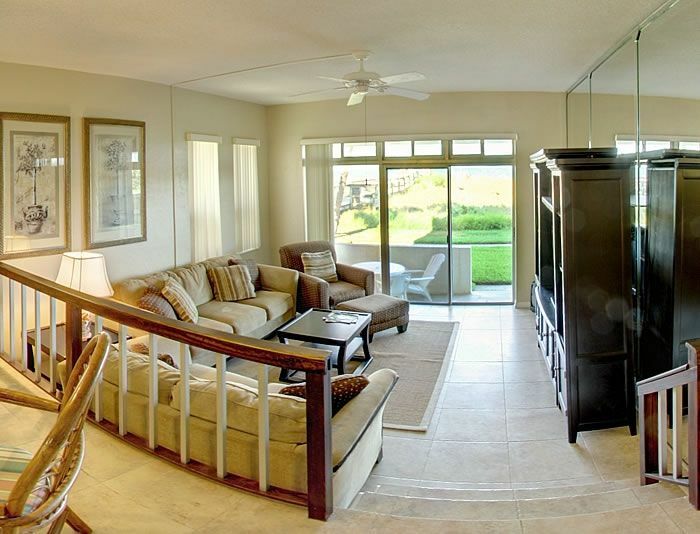 This large condo is ground floor and right on the beach. Walk from your living room to the beach and then to the Cocoa Beach Pier for lunch or dinner. Enjoy the Magnificent views of the Atlantic Ocean from the Living room, Dining Room and Kitchen, in this unique tri-level 2 Bedroom 2 Bath unit located at Sunrise Towers. Step out of the sliding glass door and over the dunes to the white sandy World Famous Cocoa Beach for the most exciting and relaxing fun in the sun and surf you could imagine. Enjoy the spectacular sunrises and your morning cup of coffee from the patio or the beach. This beautiful unit is not your conventional floorplan. Rather, this unit is on multi levels offering both a spacious and private feel. The bedrooms are upstairs and downstairs respectively for privacy and comfort. This unit is a Non-Smoking and No Pets unit. All of the amenities of home are included. The unit rents MONTHLY only. Just an hour down the Beach line to all of the fabulous attractions in Orlando including Disney World, Sea World, MGM, Epcot et al. This is the closest beach to Disney World. Port Canaveral, the 2nd largest cruise port in Florida (just minutes away) is home to the Disney Cruise Ships (as well as all other major Cruise Lines). Port Canaveral also offers Deep Dea Fishing excursions, Casino Boats, and some of the finest fresh seafood markets and restaraunts in all of Florida. Walk 4/10ths of a mile south to the World Reknown Ron Jons Surf Shop. The unit is also a short drive to Cocoa Village in the City of Cocoa, a very unique shopping and dining venue where you can enjoy a getaway from the usual chain restaraunts and stores. There is no better central location in all of Florida. You are a car ride away from most major attractions and places of interest in Florida. My wife grew up in Cocoa Beach at the height of the Space Program. We have family in the area and travel there often. Thereis no finer location for a vacation place or a full time rental for that matter. You are on the beach yet a hop, skip and a jump from Orlando and all that it has to offer. You are also close to Daytona to the north and Vero Beach to the south. The floorplan on this unit is truly distinctive and the proximity to the beach is beyond compare. Just step out of the sliding glass doors and within a few feet you will be on the sand. While this unique unit is on several levels, there aren't too many stairs to traverse. The bedrooms are located apart from one another but not too far apart. While there is privacy, the rooms are still close enough to be near the kids. Also, the living area is separated so that some people sleep while others can socialize. Just 24 units at the Sunrise Towers provides a quiet retreat.